I had a dream,"Baba was waking me up and I told Baba let me sleep as I am feeling very sleepy", Baba took a bowl in His hand and told "What? Will you not give me khichadi today"? 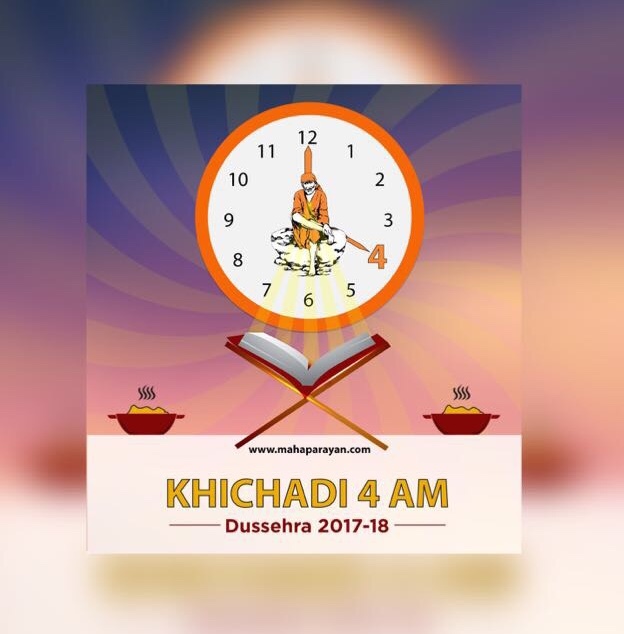 Hearing these words I suddenly got up and saw the time it was 2:55 a.m. Thanked Baba for waking me and got ready for my khichadi parayan, Saptaah, Mahaparayan and all other parayans. Throughout the day never felt sleepy nor had my leg pain and was very active. Thank You very much Baba for making my day so beautiful and helping me to complete all my parayans. I was feeling ever fresh whole day. Thank You Baba for Your blessings and thank You Everyone for reading my experience. When we cast all our burdens on Him, then we just need to sleep peacefully on His lap and our Sai Maa will surely uprise us at the right time and will ensure we attend to all our endeavours- Spiritual and material both. As we have seen earlier also Khichadi Parayan Group itself is a miracle in all respects! Thank You Baba for blessing us with Brahma Muhrat Khichadi Parayan. Love You Sai. Jai Jai Ho Sai…! Hello devotees, i want to share a Baba's dream with you all. I didn't understood the meaning of this dream, hence please guide me devotees regarding this dream. After my postgraduation i dropped a year for qualifying exam but couldn't get through it and it has really affected my confidence a lot. Nowadays if any interview come up, i become very nervous on the thought of facing panel and also cry on the thought of leaving my family. I am always worried about how i will alone without my parents (although i have been living alone for 6 years for my studies!). I recently came across a phd opportunity, which was once my dream. Instead of being happy i again cried as i don't want to live alone for such a long time without my parents. Thinking of same i drifted off to sleep. I saw in dream that i am sitting in the same phd interview alongwith other candidates with my pg dissertation and books. I was feeling very nervous and negetive in dream. Then i saw Hanuman ji's idol and Sai Baba'a idol (which i worship daily) on my books. I felt relieved on seeing them. Interview starts and i am unable to answer any question. I again look at the idols and found that the head of Baba's idol has detached and lying on books, the eyes looked as if they were shedding blood. I was really scared on seeing this, all kinds of negetive thoughts were storming my mind. But then i remembered that Baba used to free devotee of pain and tension by giving them such dreams. I felt relaxed on such thought. Then i saw the interview has ended and i saw a couple clad in white sitting on white asan, the lady was wearing a rudraksh maala . In dream i recognized them as Lord Shankar and Parvati Ma, my heart was continuously telling me, they are Bhole Baba and Parvati Ma. They pointed at someone saying "Yeh Brahman hamesha apna Sar alag kr leta h". I turned to find out whom they were pointing at, and saw my Baba's idol, perfectly fine (coming to life and coming towards them). Here my dream ended. I woke up really confused. Kindly help me devotees to understand it.